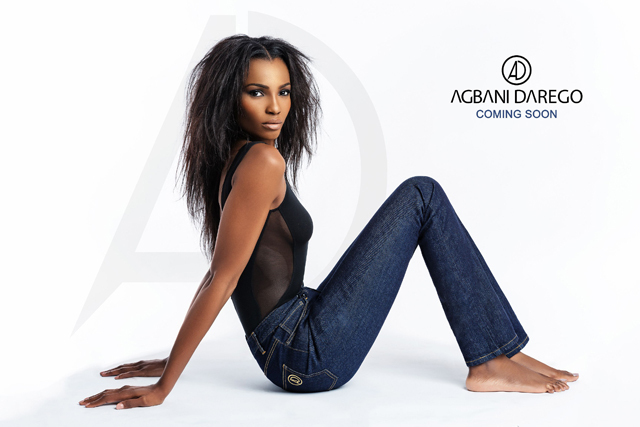 for her denim line AD by Agbani Darego. The denim line embraces a luxurious and chic aesthetic that’s affordable with cuts and styles that are flattering to a range of body types. pleasure creating a line that’s intuitive to our body, style and pocket needs. I am excited about it and I hope that it will be well received” says Agbani. The first products to be launched are its range of Jeans, Polo shirts and its Zip front Shirt Dress.Named after the Nigerian woman, the Jeans will come in four styles; Bola- “Trouser Leg”, Aisha-“Classic Cut”, Ify-“Boyfriend Jeans”, Nosa-“Skinny Jeans” and in a variety of washes. AD by Agbani Darego will be available in stores and on-line in June, 2013. Labels: Agbani Darego, designer spotlight, lookbook, lookbook Photos, Nigerian designer, NIGERIAN FASHION.